138 Nigerians return from Libya – Royal Times of Nigeria. About 138 Nigerians on Tuesday, voluntarily returned to Nigeria from Libya with the help of the International Organisation for Migration (IOM). 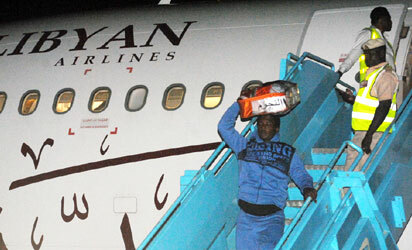 The returnees, who were received by the officials of the National Emergency Management Agency (NEMA) with the help of other agencies, were said to have been stranded in Libya following failed attempts to cross over to Europe – they arrived at the Cargo Wing of the Murtala Muhammed International Airport at about 8.05 pm. The Zonal Coordinator of NEMA, South-West, Suleiman Yakubu, said four out of the returnees were critically ill and needed urgent medical attention, stating that the 138 people were made up of 65 female adults, two teenage girls and two female infants; 64 male adults, two teenage boys and three male infants. He said, “The 138 returnees were brought back to Nigeria on the expression of interest to return to the country through the assistance of IOM,”. He also urged the returnees to look forward to a brighter future ahead as the government had put various initiatives in place, to tackle challenges facing the country, with the aim of restoring hope to all Nigerians.